The Boldt Decision turned 40 this week, marking four decades since tribes of the Pacific Northwest were granted a 50-50 share of salmon and steelhead fisheries and co-manager status over their natural resources. Just this week, Washington state legislators are expected to decide on a bill that would pardon the dozens of activists arrested in the 1960s "fish wars" protests that led to that monumental court decision. The two-part decision was handed down in 1974 by Judge George Hugo Boldt in U.S. v. Washington, a watershed moment in Native American rights law that laid the groundwork for Native American law across the U.S. and up to the present day. Billy Frank Jr. was a leading figure in the 'fish war' years, as pictured left. Pictured right more recently, as the director of the Northwest Indians Fisheries Commission. Photographs courtesy of NWIFC and Debby Preston. The decision allowed tribes to work hand-in-hand with the state to co-manage all fishing resources, including those outside of reservations. This became particularly important after fish stocks suffered major collapses in the 1980s, and both Indian and state managers focused on the need to protect fish habitat and support long-term recovery of the once vital fisheries. The Boldt Decision also spurred the creation of the Northwest Indian Fisheries Commission, which supports its 20 member tribes in this role as natural resource co-managers. Co-management is now firmly established, but in its day Boldt’s ruling was so shocking to non-Native American fishermen that angry protestors branded Boldt a traitor and publically burned his effigy. For Boldt, a political conservative and a fishermen himself, the ruling was simply a strict interpretation of a critical phrase in the 1850s-era treaties that Isaac Stevens, then governor of the Washington Territory, had negotiated with the region’s tribes: “The right of taking fish…is further secured to said Indians, in common with all citizens of the territory.” Boldt interpreted “in common with” to mean a right to half of the harvestable catch – a right that had been systematically denied to the tribes for over a century. The lasting importance of the Boldt ruling is vast. The so-called “Culverts Case” – filed in 2001 and decided in 2013 – is one of many contemporary cases linked directly to the Boldt. A Washington court ordered the state to repair more than 600 culverts under roads that block the passage of salmon through hundreds of miles of potential habitat, thus violating those same 1850s-era treaty rights. 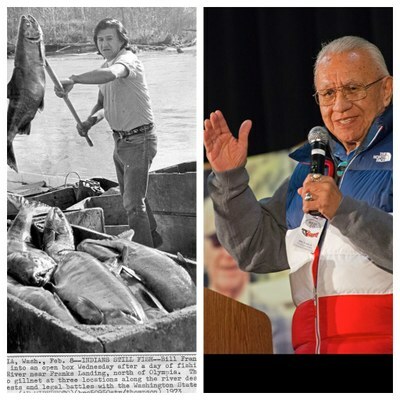 Yet the state has appealed the decision, to the dismay of Northwest Indian Fisheries Commission chairman and “fish wars” forerunner Billy Frank Jr., who called the appeal a disappointment. The appeal argument is set to be heard in court in the fall. A display at the Boldt 40 gathering highlights the history of major cases in Native American law, ever since Boldt. Photo courtesy of NWIFC and Debby Preston. But beyond its impact on fisheries and natural resource management, the principle of state-Indian cooperation that underlies the Boldt Decision has set a national precedent that has informed more than 100 Indian law cases in the Supreme Court alone and countless cases in state courts, touching everything from land sale to child custody issues. It has even laid the groundwork for major legislation like the 1988 Indian Gaming Regulatory Act, which enabled tribes to build casinos and raise capital to fund their governments. The effects of that act have dramatically increased tribal sovereignty across the U.S., and may not have been possible without the state-to-Indian government cooperation established in the Boldt Decision. Wilkinson said that ever since U.S. v. Washington, at a time when his own career as a Native American rights lawyer was beginning, “the tribes are vigorous, robust governments, and taking actions under their sovereignty, which still conflicts with state sovereignty with some regularity,” and the Boldt Decision continues to allow for these conflicts to be addressed in court. While critics still exist, by and large Americans have come to see Judge Boldt, the Boldt Decision and its 40-year wake in a positive light. Passing the new bill to pardon those who were prosecuted before the wave of change crested in 1974 would be a fitting testament to their legacy. Chrisi Turner is an editorial intern at High Country News. She tweets @christi_mada. Correction: The original version of this story incorrectly stated that Charles Wilkinson assisted an attorney in the U.S. v. Washington case, but he did not.